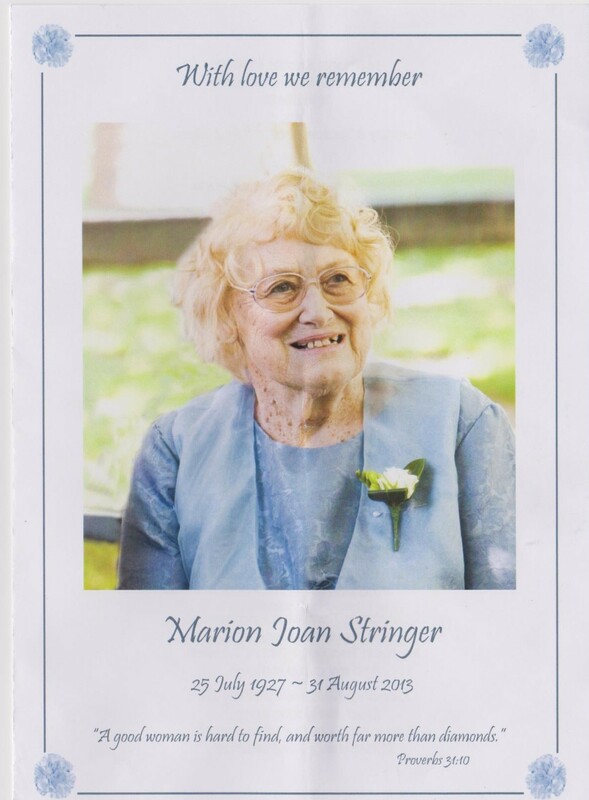 Marion’s funeral service was held at St John’s Anglican Church, Wakefield on 3rd September, 2013. In bright spring sunshine, about 100 people filled the 150 year old church and overflowed outside to seating in front of the main door. It was a celebration of an active, joyful life lived by a warm, caring and enthusiastic woman who had managed to balance the career of teaching with a love of tramping and raising a family. The text from Proverbs on her service sheet said it all: “a good woman is hard to find, and worth far more than diamonds.” She had achieved recognition as the person who knew more about the history surrounding the village of Wakefield than anyone else, producing 13 books on organisations and the people of Waimea South in 10 years. She and her husband Buster officiated at our 30th year celebrations at Stafford Place. Those present to remember and pay their respects were treated to sparkling wine and a lavish afternoon tea – by her special request. Hello, I’m researching Thomas Hoyle Stringer who married Priscilla Bacon in 1854 in England and came to Nelson on the ‘Gypsy’. Following them were lots of Baldwins of whom I am a descendant. I was fascinated to see that in trying to find a copy of From River to Range I came across the notice about Marion Stringer’s death. Is the book still available? Can you help me with any living relatives? Hi, Anna. Yes, “River to Range” is still available for $10.00 from the Tasman District Library in Richmond, Nelson. There is more extensive information on the Stringer family in Marion’s book “Just Another Row of Spuds” which, sadly, is out of print but can be borrowed from the libraries in the Nelson district. However, I can’t find mention of Baldwins in those books or in the “More Spuds” book. Thanks for your reply which I missed last year (I was looking for an email). I’m coming to Nelson in the middle of February 2015 and would love to come and do some research at the historical society. I gather that there may have been Stringers in Nelson before Thomas Hoyle Stringer (THS) came over. The lady he married, Priscilla Bacon, was related to the Baldwins. Even borrowing Marion Stringer’s book would be helpful. It looks like there may be living relatives as well. My father (Peter Langton Baldwin) was born in Howick in 1922 but went back to the UK which is why I was born there. His grandparents and their two children (his father) came to NZ in 1908. They came because THS had come over first followed by young cousins who I think came to work with THS and then bought land in Blenheim to grow orchards. My great aunt stayed as did four other cousins so there are many relatives in NZ. It would be great to help you in any way. There are indeed many Stringer relatives in Nelson including Marion’s husband Buster who is living in a retirement village in Stoke. I’m sure you can find out much information. I will contact you via e-mail. Regards, Roger Batt. Could you contact me on the email below as you suggested please. I was wondering if there was a copy of ‘Just another row of spuds’ I could borrow while around Nelson. I could get one out of the library but am going to be over near Takaka for 5 weeks in March and it may not be convenient. We can look at the details by email.